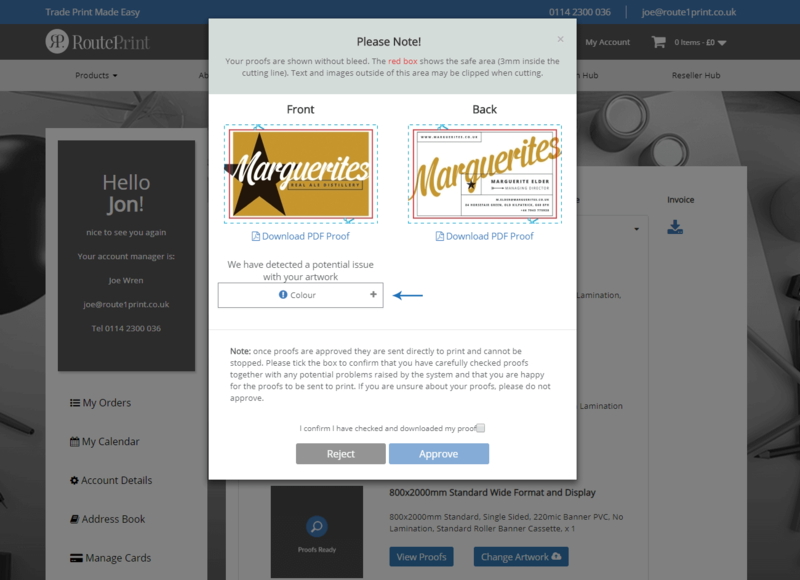 We know that when you make an order, you want to get that order off to print as quickly as possible. You don’t want to have to interrupt your day to approve proofs for artwork that you uploaded ages ago. That’s why our online proofing tool gives you a proof almost immediately! Now, you might remember that we used to give you a few proofing options to choose from; original, fit to size, and auto bleed. These days though, we’ve managed to refine the process to automatically select the best option for you! 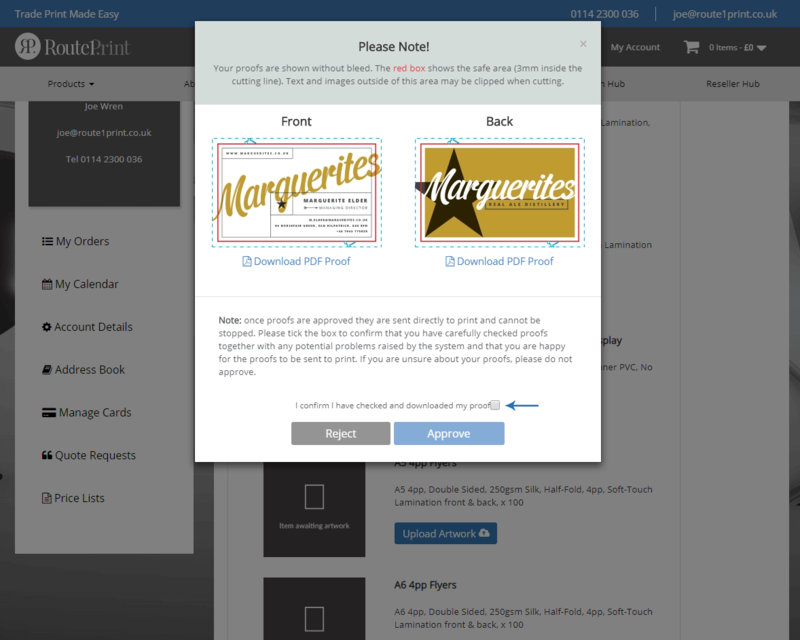 After a few seconds, your artwork will be processed and you can view your proof. Remember to download the pdf provided because the thumbnail does not always give an exact representation. You’ll notice that two lines have been added to your artwork; a blue dotted one to signal the cut line and a red solid line to mark out the ‘safety zone’, 3mm in from the cut line. Ensure that all borders and important information are within the safety zone so that they definitely won’t be cut out during the trimming process. As well as giving you a proof to check, our tool will flag up any issues that could lead to a poor quality print. If you’re okay with your proof, knowing that these issues have been flagged, you‘re more than welcome to carry on and approve your proof. However, if you’re unsure, please do not approve your artwork. Instead, you can upload a new file or you can request a manual proof from our studio team by emailing the file to artwork@route1print.co.uk. Bear in mind that this could delay your order slightly as our turnaround times are based on when your proof is approved. Don’t forget! You should also add the studio email address to your contacts folder to avoid the new proof landing in your spam! Step 3: Approve Your Proof! When you’re happy, you can send your artwork off to print! All you have to do is make sure you’ve ticked the box in the bottom right corner to confirm that you’ve checked the proof and then click “Approve”. Sorted! Once approved, our studio team will take your artwork through a 30-step manual check for that added security. This just ensures that nothing gets missed, even if our automatic process hasn’t picked up on an error. Remember: Some of our products cannot use the online tool and require artwork to be fully manually proofed. Artwork for Presentation Folders, Booklets and PVC Banners will all need to be emailed directly to our studio team at artwork@route1print.co.uk.